St. James School offers extended day services to our families within the school community. The primary purpose of our extended day program is to accommodate the schedules of working parents and to reduce the number of “latch-key” students. We staff the center with caring school personnel and certify all of our extended day personnel by the Norwich Diocese Office of Safe Environment. Certification includes a background check, fingerprinting, and DCF background checks. We will provide children in the program with opportunities for art activities, outside play, snack, quiet time for rest or catching up on homework, group activities, community service projects, and much more. For more information on our Extended Day program, please see our parent handbook. Morning Session: 7:00 a.m. – 8:15 a.m. Afternoon Session: 2:45 p.m. – 5:30 p.m.
We offer extended day services each morning and afternoon when school is in session. Children may participate on any of those days and for whatever amount of time is convenient for your family. We will not hold extended day services on days when it becomes necessary to cancel or dismiss school early due to inclement weather. Late Fee: $3.00 every 10 minutes after 5:30 p.m.
We will send children not picked up by 3:00 p.m. from the car line to the extended day program. We expect parents to pay for this service. We bill on a weekly basis with charges calculated on the half hour. Please make checks payable to St. James School. We ask that you do not combine these monies with any other school payments, such as lunches. To make the accounting process more systematic, please pay each week after receiving your bill. Please drop off and pick up your child at the extended day room door, accessible from the playground side of the school. For safety and billing purposes, we require parents to sign students out before leaving. If another person is picking up your child on a particular day, please send a note or call the school to let us know. We are concerned for your child’s safety and will not release your child to individuals without your express approval. Persons other than a custodial parent who pick up your child must show some I.D. If they are unable to provide I.D., we will contact you. Your child will then remain in extended day until a custodial parent arrives. 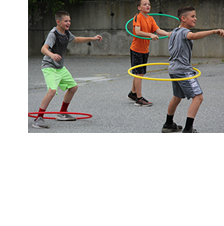 During Extended Day hours parent may call (860) 382.6433 if they will be delayed in picking up students or during school hours can contact Mrs. Benoit, extended day coordinator at (860) 774.3281 or email.